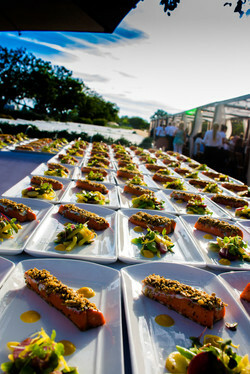 Salmon at the Kendall-Jackson Farm-to-Table dinner last June. Photo courtesy of K-J. The Kendall-Jackson Farm-to-Table dinner last June. Photo courtesy of K-J. 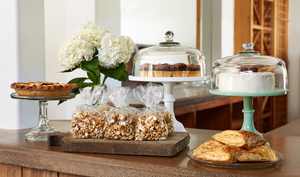 Hazel in Occidental is now serving brunch and lunch, including plenty of pastries. Photo courtesy of Hazel. 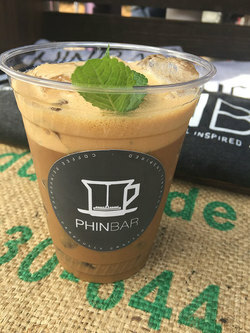 Minty Vietnamese iced coffee from PhinBar, at the West End Farmers Market in Santa Rosa. Photo by Heather Irwin. 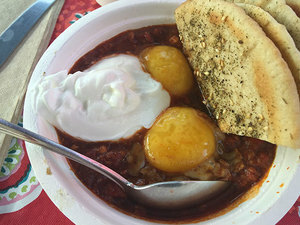 Shakshuka, a Tunisian dish of eggs, tomatoes, yogurt, and spices at Goodman’s Jewish Deli, part of the Sunday West End Farm Market in Santa Rosa. Photo: Heather Irwin. 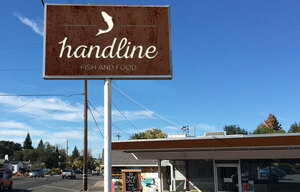 Handline Fish and Food will be opening in Sebastopol in 2016. Photo courtesy of Lowell Sheldon. Farm-to-Table Dinner: I’m always a sucker for a dinners in a vineyard—the kind of stuff people from Milwaukee think is a daily thing for us Wine Country people. And while it happens often enough, there are only a handful of these dinners that really surpass my expectations. Kendall-Jackson’s Farm-to-Table Dinner is a so-worth-it affair, on Saturday October 24th from 4:30pm to 7:30pm. 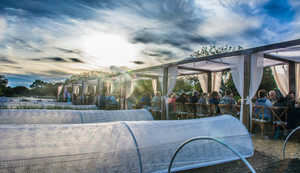 From the view of farmer Tucker Tyler’s incredible gardens (literally at your feet) to the sun setting in the vineyards to a tablescape worthy of Martha Stewart and chef Justin Wangler’s squeal-worthy dishes. Did we mention there’s wine? Yup, lots of that too. General admission is $125; details online. ~HAZEL~ in Occidental, which has been hitting it out of the park for dinner, has started lunch and brunch service. On the menu: pumpkin cinnamon rolls with cream cheese frosting, grilled sourdough from their wood-fired ovens with homemade jam, savory bread pudding with Pugs Leap chèvre, beef cheek hash, and a lamb merguez wrap sound luxe, along with pizzas and salads for lunch. You’ll likely need to work off all the decadence with a round-trip bicycle ride out to Occidental, or you know, not. Either way, grab a seat in the sunny dining room or on the small porch. Sat-Sun brunch 10am-2pm, Wed-Fri lunch 11:30am-3pm. 3782 Bohemian Hwy., Occidental, 707-874-6003. The much loved Petaluma Italian restaurant ~CUCINA PARADISO~ is expanding north to Santa Rosa. Owner Dennis Hernandez took over Roberto’s Trattoria Lupo on Sonoma Highway this summer, with plans to reopen in early November. The menu will be similar to the Petaluma restaurant, which has been a longtime Michelin Bib Gourmand selection. Chef Angelo Cucco will take over the kitchen, an SF chef and pal of Dennis. Farmers’ Market Report: I always love finding a dish I’ve never heard of before. This week, it was shakshuka, a Northern Africa one-dish meal that wakes up your taste buds with a one-two punch of cayenne-spiked tomato-red pepper sauce and gently coddled eggs, laffa, and yogurt. Onions, cloves, garlic, and other spices tag team in each splendid bite. You’ll find this little gem of a breakfast, along with bialys, egg creams, hummus, and even a vegan pastrami at ~GOODMAN’S JEWISH DELI~ at the ~WEST END FARMERS MARKET~. Here’s the thing, though: They make a limited amount of food each week, so come early and be prepared to grab a Vietnamese coffee from PhinBar, a cuppa at Retrograde Coffee Roasters (hand-roasted drip coffee, more on them soon), or a loaf at Revolution Breads. Save room for my incredible Sonoma County Fair find, Nuevo Sazon, who’ve also joined the market, serving their torta ahogada, a roll dipped in tomato sauce, then stacked up with carnitas, onions, and refried beans. Restaurateur Lowell Sheldon of Sebastopol’s ~PETER LOWELL’S~ will open ~HANDLINE FISH AND FOOD~, a “California coastal-inspired restaurant” next May with partner Natalie Goble. There has been plenty of speculation about what’s going on at the former Foster’s Freeze on Gravenstein Highway. Sheldon plans to offer a chef-driven menu that isn’t about clam chowder and fish and chips; he says it will be inspired by Californian flavors. “We are many things in California, but essentially we are a blend of Mexican and American. This is our history, and this is what we grew up eating,” said Sheldon. Inspirations for the restaurant, he said, include the Marshall Store, Fish, Gott’s Roadside, Swan Oyster Depot, the old Foster’s Freeze, and El Molino Central. The menu is still in development, but think ceviche, fish tacos, burgers, seafood stews, and salads. ~HERITAGE PUBLIC HOUSE~, a brewpub in Santa Rosa, has shuttered, effective immediately. According to proprietor Dino D’Argenzio, turning over the kitchen and management to restaurateur Josh Silvers in April 2015 “didn’t fit” and the parties have ended the relationship on a “friendly note.” Several months ago, BiteClub tasted through the menu, which was impressive, but it was recently cut back significantly. “It’s disappointing it didn’t work out,” said Silvers. “The team was really jelling. I’m hopeful in this time of employee deficits they will get snapped up fast,” he added. Silvers is the owner of Jackson’s Bar and Oven and does frequent restaurant consulting. The on-site ~BLOODLINE BREWING CO.~ was a significant part of their tap program and will continue brewing offsite, focusing on increased distribution throughout the Bay Area. Bloodline is co-owned by several members of the D’Argenzio family. 1901 Mendocino Ave, Santa Rosa.